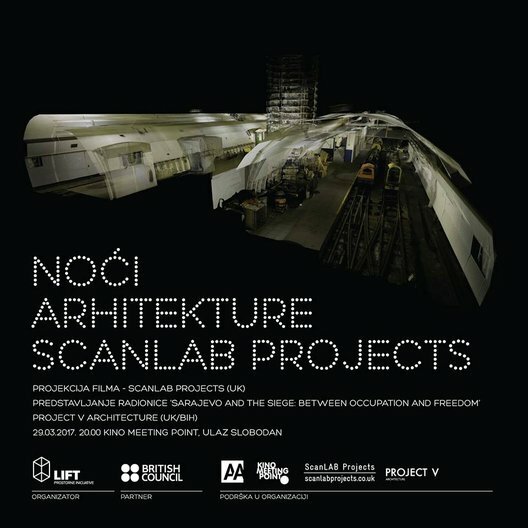 Days of Architecture Sarajevo and award winning studio ScanLAB Projects will launch the project "Sarajevo and the Siege: Between Occupation and Freedom'' this week in Sarajevo. ScanLAB specialise in the use of large scale 3D scanning in architecture. They digitise the world, transforming temporary moments and spaces into compelling permanent experiences, images and film. In May they will lead a workshop with local architects and architecture students to produce a piece of work to showcase at Days of Architecture Sarajevo in collaboration with London-Sarajevo based Project V Architecture. A screening of ScanLAB's previous work at a Nights of Architecture event will launch the call for emerging architects and architecture students to explore the topic "Sarajevo and the Siege: Between Occupation and Freedom'' in the workshop this May. The project comes at a time of rapid unregulated urban development when Sarajevo struggles to record and preserve its heritage listed buildings and evidence of war damage from the Siege of Sarajevo 1992-96, which are under threat of erasure. For four days architecture students and young architects will 3D scan parts of this city, whilst also exploring other surveying techniques such as hand drawing and photography. Days of Architecture Sarajevo is one of the most important events in architecture and design in South-East Europe. Conceived as an annual, multi-day festival which includes international and local architects’ lectures, exhibitions, discussions, movie projections and similar events related to the subject of architecture, design, urbanism and spatial planning. Founded in 2008 the festival has now hosted over 100 different lecturers, exhibitions and workshops from more than 25 countries. Nights of Architecture has in recent years been developed as a complementary, year round programme of follow-up evening lectures and one day events, which enables themes, discussions and relations from the main festival to continue and develop. The British Council has collaborated with Days of Architecture through its Architecture Design Fashion Biennales and Festivals grants to support this workshop. For further information visit the Days of Architecture website.